You make the caldarium oh so fun. 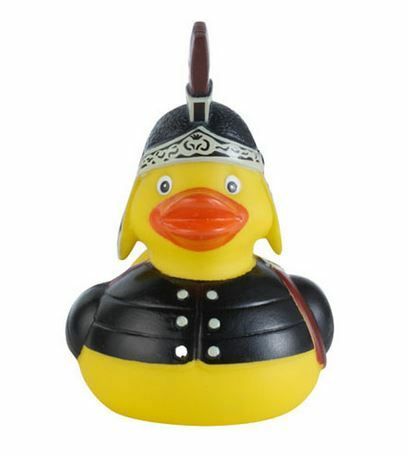 Roman ducky, I sing of arms and you! This cute little fellow wearing a legionary’s helmet and lorica segmentata armor comes from the British Museum shop, where you can also find his Egyptian, samurai, Viking, and Greek god pals. Bathing was important in Roman culture, not just for personal cleanliness but as a social activity. Friends would meet at the baths to exercise, swim in the large cold pools, or relax in the hot pools. Some Roman baths had steam rooms similar to the Finnish sauna. Even at the farthest edge of the empire, Roman forts along Hadrian’s Wall in northern Britain had bathhouses. Many were built with sophisticated under-floor heating to keep them toasty even in the winter. One crucial piece of bathing technology the Romans, lacked, however, was the rubber duck. They never knew what they were missing.